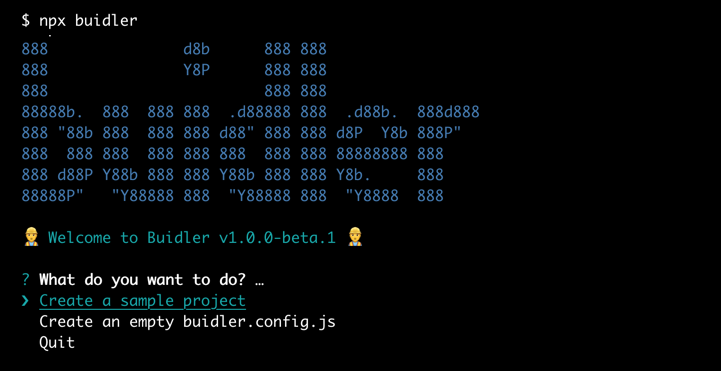 In this guide, we’ll explore how to start using Buidler in your Ethereum project. What makes Buidler special? What can you achieve with it? Buidler allows you to streamline your development workflow by making it easy to incorporate other tools into your process, as well as granting you all the flexibility you need to adapt the tools to your exact needs. What dependencies and tools you use is up to you. Buidler will only help you orchestrate them. Out of the box, you can compile your Solidity code, install plugins and create your own tasks. Let’s create the sample project and go through the steps to try out the sample task, compile, test and deploy the sample contract. NOTE: in the Buidler 1.0.0 beta release we’ve disabled the automatic ganache instance feature to keep working on its stability, so you’ll need to run it manually. This feature will be back by the time we ship the stable release. Run ganache-cli. If you would like to learn how to create your own tasks, take a look at our task creation guide . @nomiclabs/buidler-truffle5 Integration with TruffleContract from Truffle 5. @nomiclabs/buidler-web3 Injects the Web3 1.x module and a live instance into the Buidler Runtime Environment. @nomiclabs/buidler-web3-legacy Injects the Web3 0.20.x module and a live instance into the Buidler Runtime Environment. @nomiclabs/buidler-ethers Injects ethers.js into the Buidler Runtime Environment. Congrats! You have created a project, ran a Buidler task, compiled a smart contract, installed a Truffle integration plugin, wrote and ran a test using the Truffle plugin, and deployed a contract. These cover the basics to start using Buidler. Head over to Github for more guides that cover the more advanced usage that allow your process and dev toolkit to be amazingly flexible.